REMINDER …CLICK ON ANY PHOTO TO SEE IT LARGER…..USE YOUR BROWER BACK BUTTON TO RETURN TO THE BLOG. As Marie said,,,,I guess we have another new neighbor !!!!! On Saturday a new denizen to what Jack use to call my menagerie arrived. 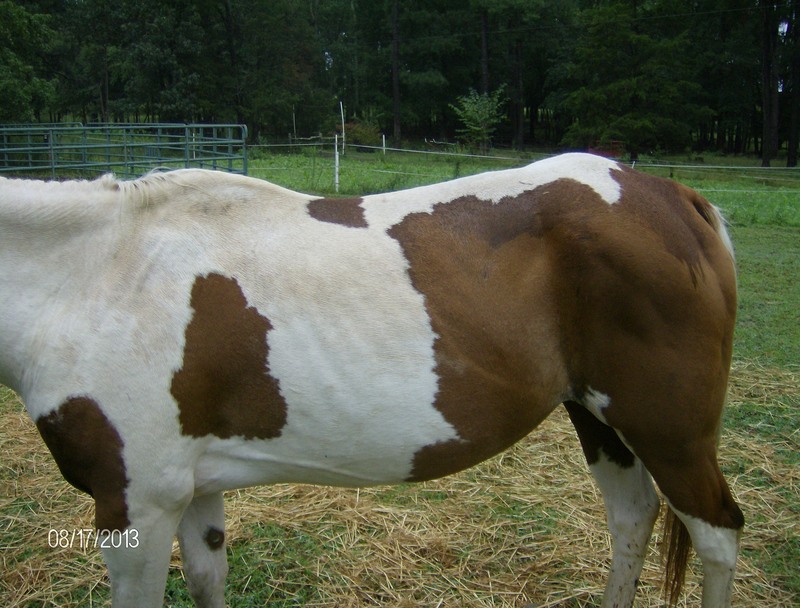 This is a little quarter horse who needed some help…he has been in a pasture with one other horse for quite some time and has been neglected. 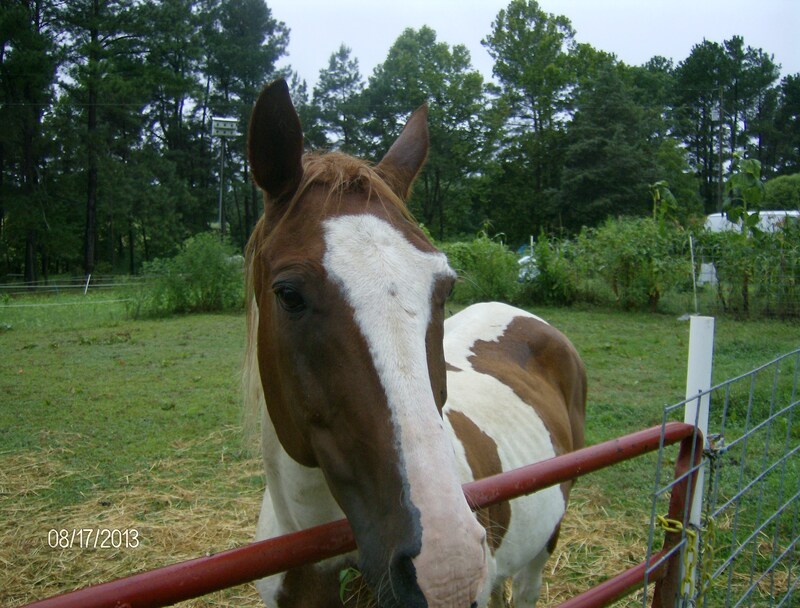 He is as sweet as he can be and nearly that lame.Jim and Colleen Leahy found a home for the mare and Stewart and I said we would take care of this little gelding. I have started calling him Pete….which is short for Palladin Perkins Pal Peter Pinto. With a few treats and a couple of feedings he is already starting to look to me when I call Pete. And he has figured out that if I hold my hand out I have a treat. This is a pretty good side view. He is not a bad little horse If we can get him sound and get some weight on him. Jim Leahey had thrown the two of them a salt block and they had really worked on it in the last two days. 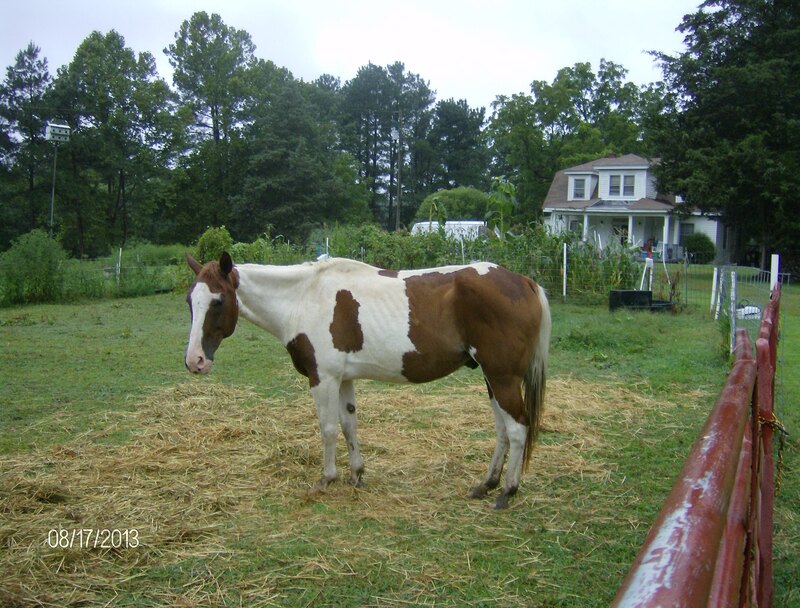 I started him on beet pulp and mineral last night….he has figured out what a bucket is for…. It is going to take a few trips to the grocery store to get him in shape….with him and Perkins it will be like feeding two teenagers…..I will spend the nesxt couple of weeks working him up onto some real groceries….last night he got soaked beet pulp and mineral and 4 ounces of vegetable oil. HE has free choice orchardgrass and timothy hay in front of him 24 7. He has pooped so he is not colicy. 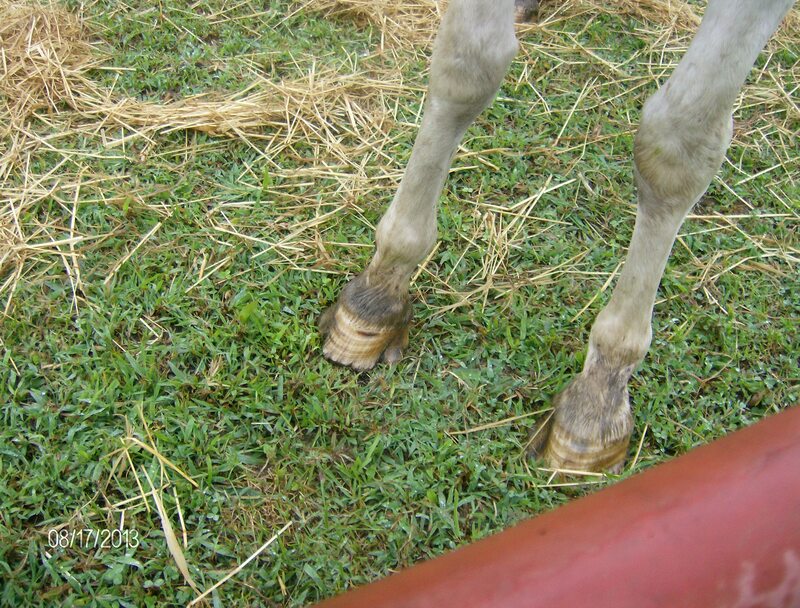 When they moved the other horse away he did some running and sored his bad feet. There are scars from previous abcesses. 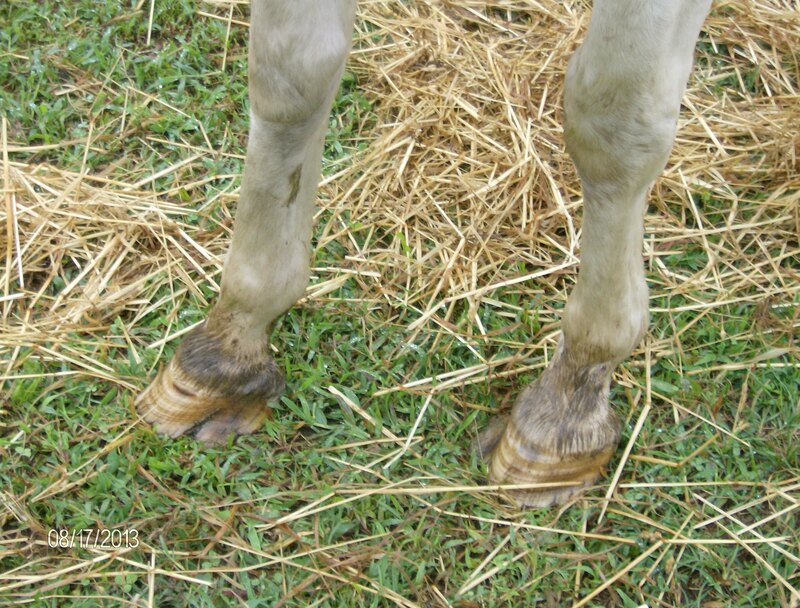 Where they were is somewhat swampy and wet and I think he probably has another abcess brewing….we will get it taken care of…..I have already called my farrier…. 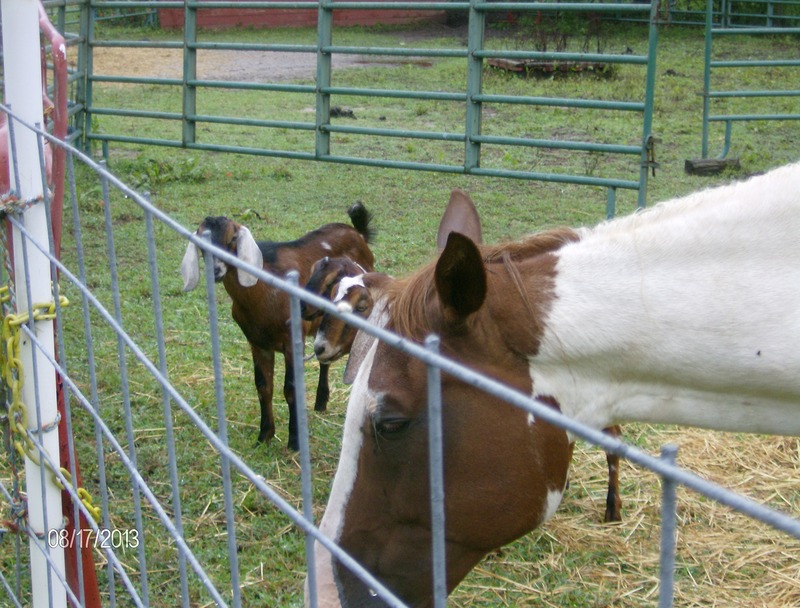 He does not mind the goats and so I put them back into the small pen with him…..I thought Star Baby and the donkeys were okay with the goats but when Pete arrived she became boss mare and started chasing everybody and kicked one of the goats. no damage apparent ….but I put them in with Pete to be on the safe side. 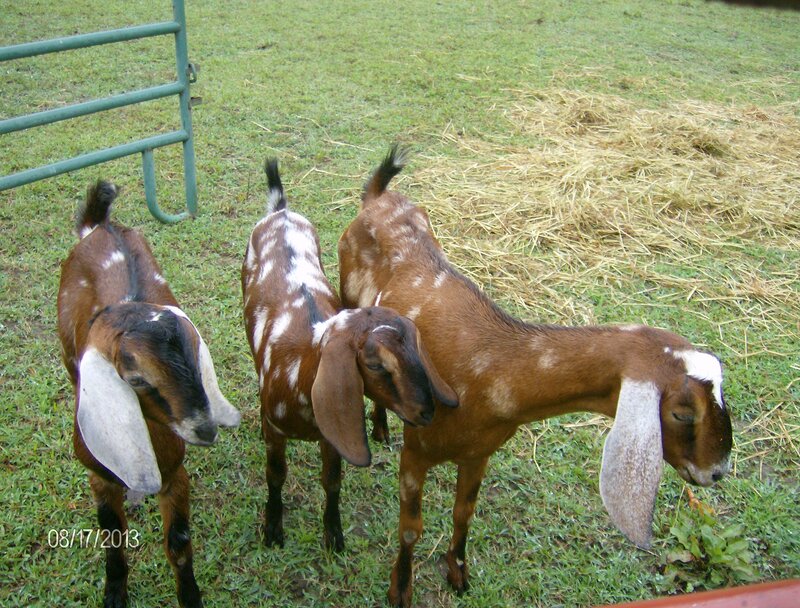 I have made some progress with the goats….for now they are staying in the pen with Pete….this is in no small part to my cutting and attaching cattle panels to the bottom of the corral panels in all ht eplaces the goats like to crawl under and come into the yard. 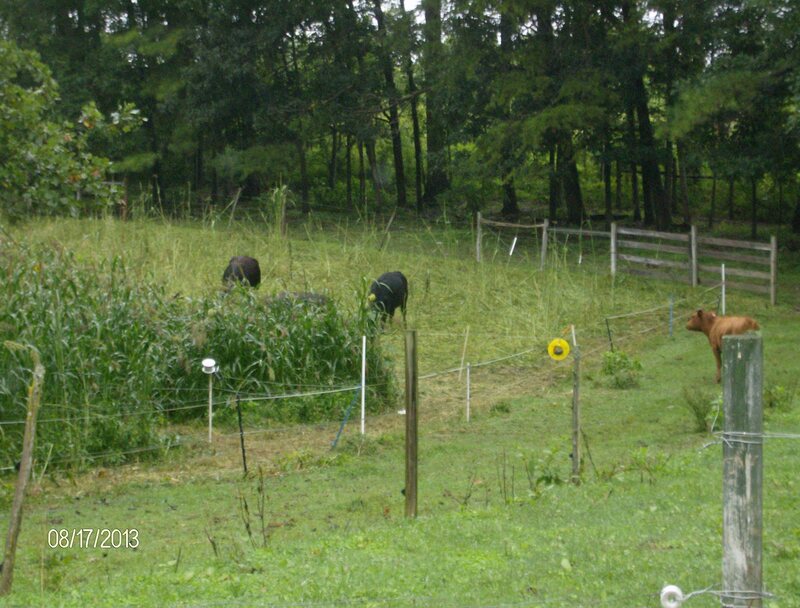 They have doen a number on the grape vines and my azaleas at the stable. They were still in with Pete this morning instead of standing under the cow barn where I have found them the last six days…. also walked them up into the woods and some of the places i actually want them and they stayed out there for about an hour and looked around….they were barn raised goats and it will take a while for them to adjust. Apache and Dee Dee are upset because In goat proofing I also eliminated their access to the pastures on the horse side because those places the goats used were the same places the dogs used to go our there…..
they managed to regraze the summer cover crop buckets again….the same ones the cows got to last week……oh well….it is raining today and they got a good rain last night and they will come back out…. 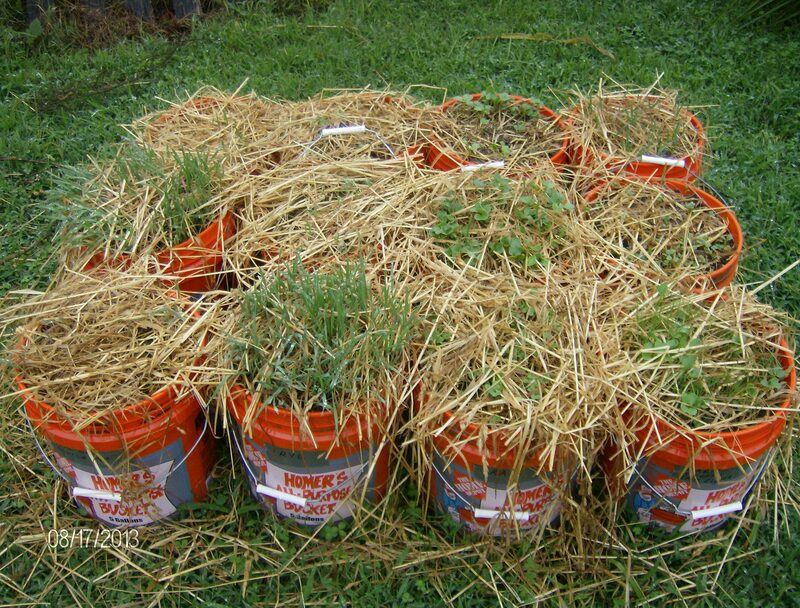 speakeing of buckets…..these are the cool season cover crops I planted last week….they are coming along nicely…..they were not far enough along to draw the attention of the goats, thank goodness…. And we started grazing the big lot with the summer cover on Friday morning. 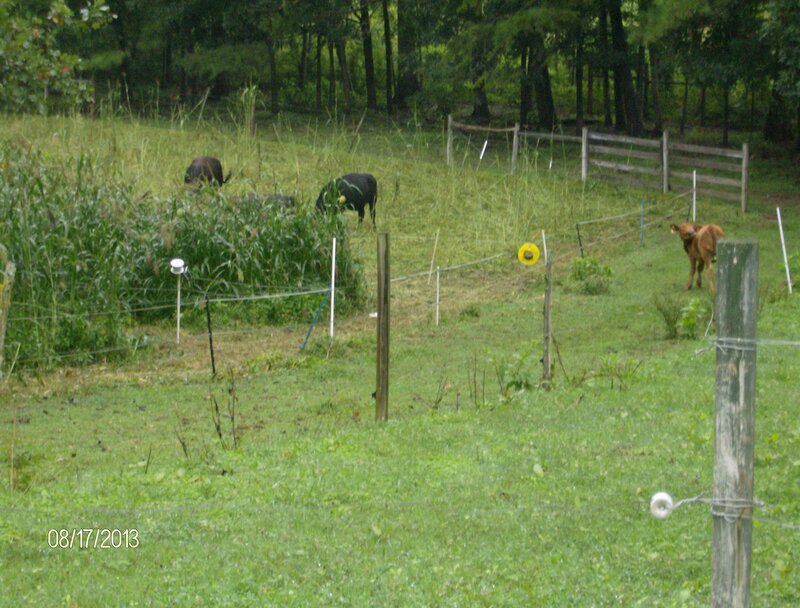 I took the bush hog and cut two paths and put up two hot wires…..I took two ten foot tall PVC pipes and stood them up to see where I was aiming to as I cut the path fo rthe fences…..cows went into it and I did not see them for 24 hours. this morning it looks like this…..it looks like they have stripped it but I know they have walked a lot of it down and there should be a lot of residue on the ground. I will evaluate this evening and determine when to open th enext strip. Two mature cows and two heifers….mine is a yearling heifer and the red is Courts and she is just a weanling…..four animals and they went through that stuff like Sherman went thru Georgia…. I have not planted any grass or cover crops this weekend….the lot the horses just came out of got a lot of residue stomped down and it really does not need a cover….nor does the one the cows just came out of…..the patch I planted up by the road is starting to show good growth and the buckwheat is blooming nicely. 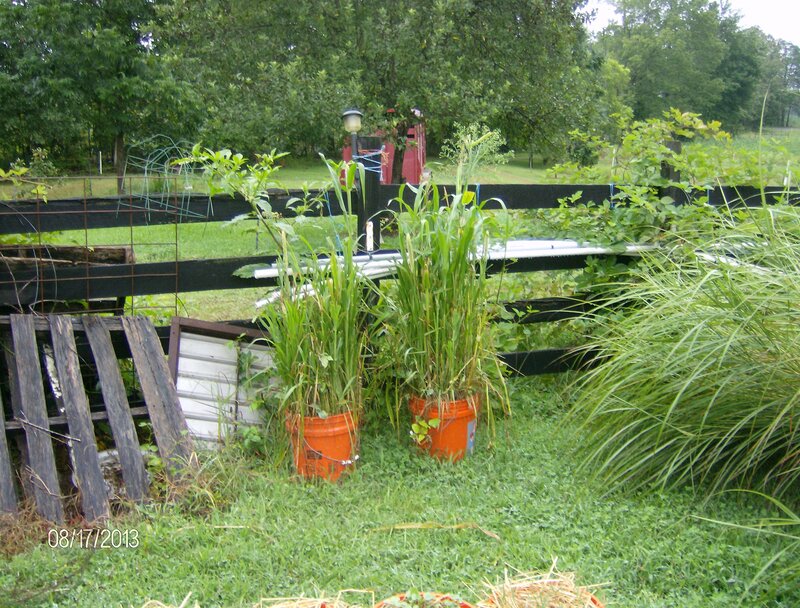 I probably should go out and scatter some seed but we had 9/10 of an inch last night and it is drizzling now and I don’t want to tear up any fields and the cover needs to be gotten to the soil and or covered…..